Typically my posts here pertain to the loss of buildings. This one however targets the erosion of streets. Streets are literally the backbone of the City. Besides parks, they make up the majority of the area of the public realm. They not only carry the traffic of automobiles and pedestrians, but they define the character and scale of districts and neighborhoods, as well as delineate building and property frontage. The simplicity and flexibility of the urban street grid is what separates the City and its inner suburbs from post WWII suburbs which are more often than not defined by cul-de-sacs and overcrowded collector roads. 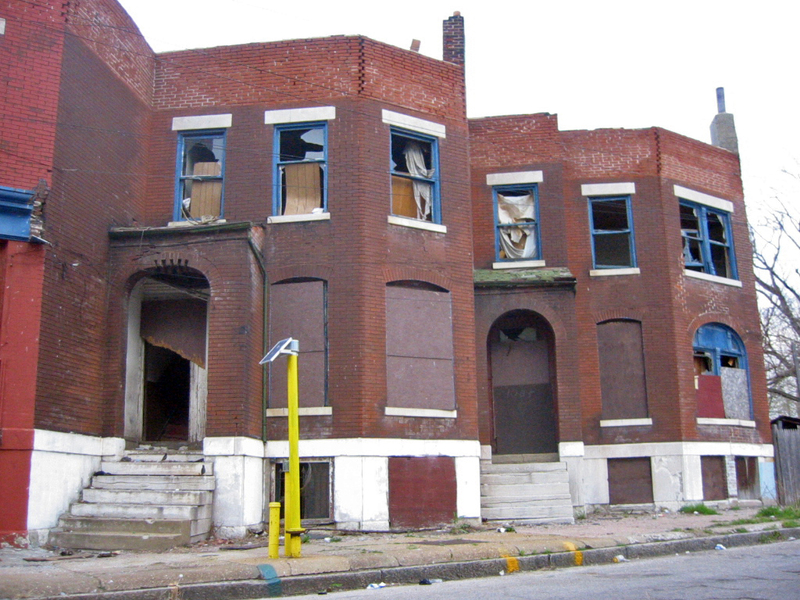 Unfortunately, the City of St. Louis does not recognize the inherent value of it's streets and often gives away, yes, gives away these assets to private hands. This is the case in Midtown where SLU has persuaded the City to vacate Josephine Baker between Locust and Washington creating a superblock about 870 feet long. This is twice as long as today's city planners recommend to create a walkable environment in an urban area. Longer blocks also increase vehicle travel speeds due to the distance between intersections. 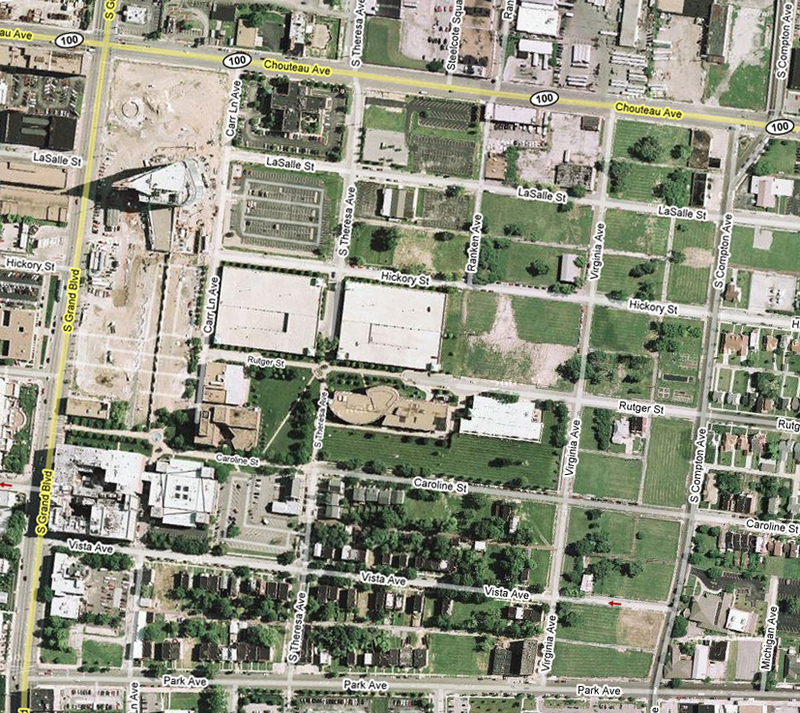 Several years ago, SLU bought properties in bulk in this area as a potential site for their new arena. Fortunately some owners held out, which spared dozens of buildings from the wrecking ball, and SLU was forced to build south of their campus on an old school site (which they demolished). Instead of divesting the properties north of Lindell, SLU seems to have gone into land-banking mode, holding and sitting on many properties, and demolishing several buildings, including the Locust Livery Stable, one of the oldest buildings in the area, to create vast surface parking lots. 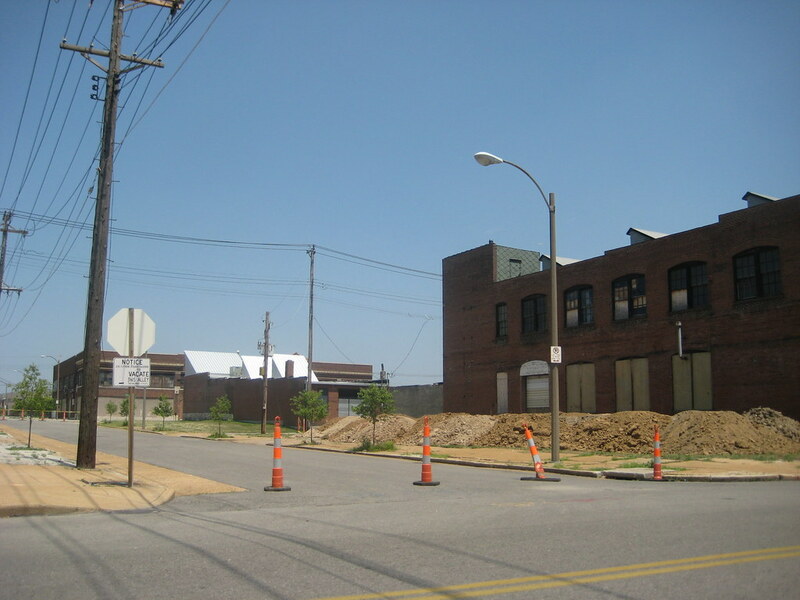 SLU owned two narrow lots on the east side of Josephine Baker, and this spring decided to take the street and two thirds of an alley as well. The legislation (page 23 - bills 8 & 19) breezed through the third read and passage at the Board of Alderman on July 3rd. Presumably SLU will swallow the vacated stretch of Josephine Baker into a gian sea of surface parking which will likely egulf the vacant lots as well. 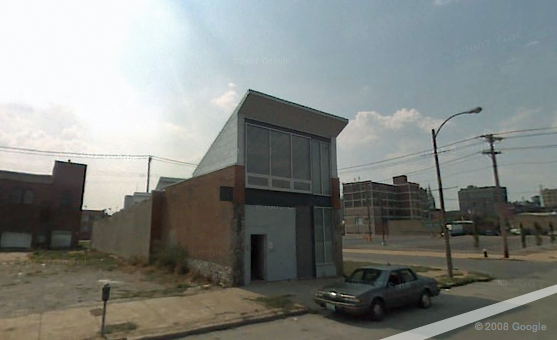 SLU owns two architecturally significant buildings facing locust east of the expanding parking lot as well (see photo below), and it remains to be seen if they will attempt to demolish these as well. 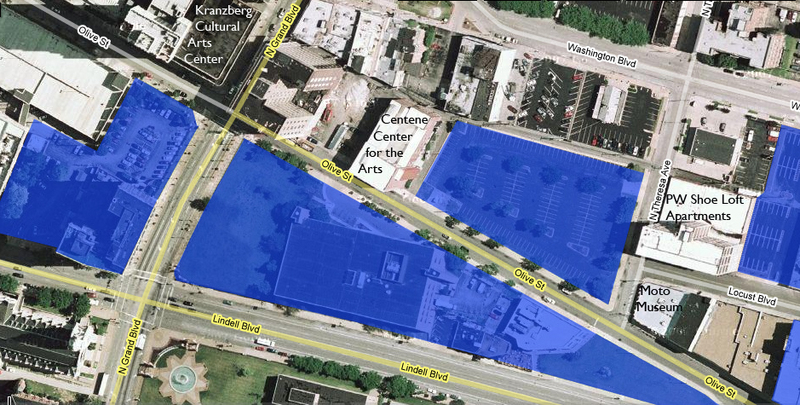 SLU's hunger for needless parking lots has created a roadblock to local development. 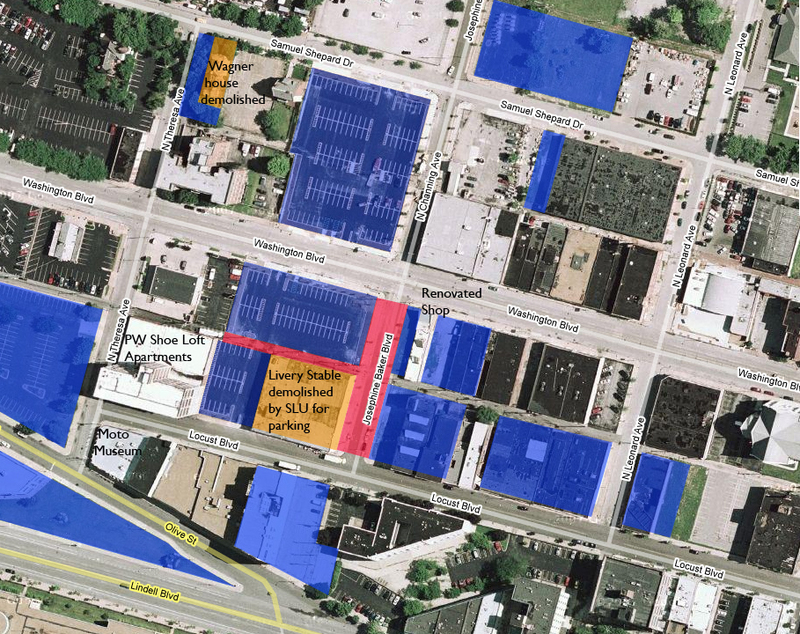 The parking lots and other properties SLU occupy a key location between the flourishing Locust Business District and the steadily emerging Grand Center. The area holds the opportunity to become the bridge that knits the two areas together, but instead remains a wasteland of vacancy holding the two adjoining districts back. Already on the superblock, the former Zane Williams Printing Co. building is being trasformed into the PW Shoe Lofts, and Carter Hendricks, one of the hold-out owners when SLU was aquiring for the arena, has done a fantastic renovation of his shop at 3336 Washington (photo below). According to an RFT article published last year, Jassen Johnson wanted to buy the Livery Stable and renovate it. Now the parking lot in its place and the closure of Josephine Baker create a black hole. Further west, at the southern entrance to Grand Center, SLU's reluctance or inability to develop the the vacant land where they demolished the Marina Building during the now subdued development boom leaves a poor impression at a very important corner. Across Grand, a fenced surface parking lot north of Jusuit Hall greets visitors to the newly opened Kranzberg Cultural Arts Center in former Woolworth's building. 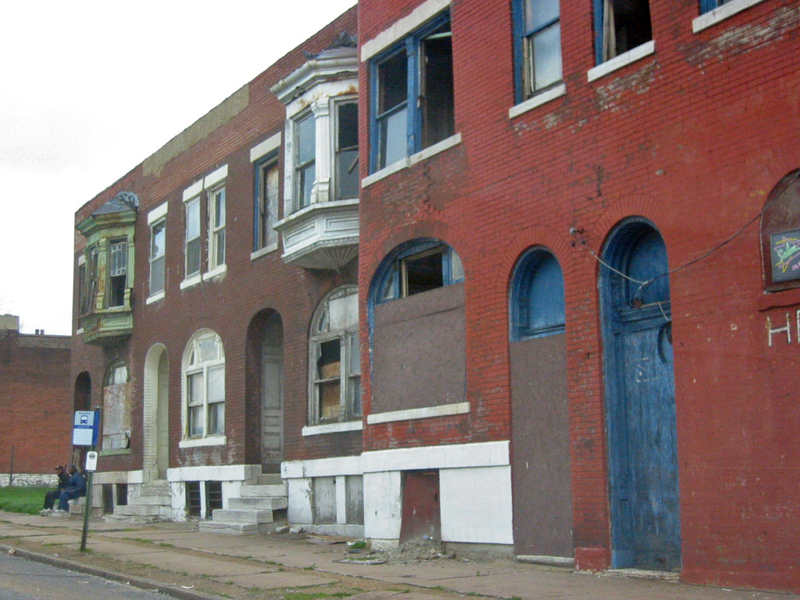 What will ultimately become of all this vacant land? Know one seems to know, and no one is putting any pressure on the university to do anything about it any time soon. This pattern follows closely to MO with which SLU has operated for years at its medical campus to the south. Stretching west from Compton, block after block of empty land gives the appearance of the aftermath a nuclear holocaust. Are they really going to build med-school related buildings on all that property in our life times? Hopefully we will not all be dead before we find out. 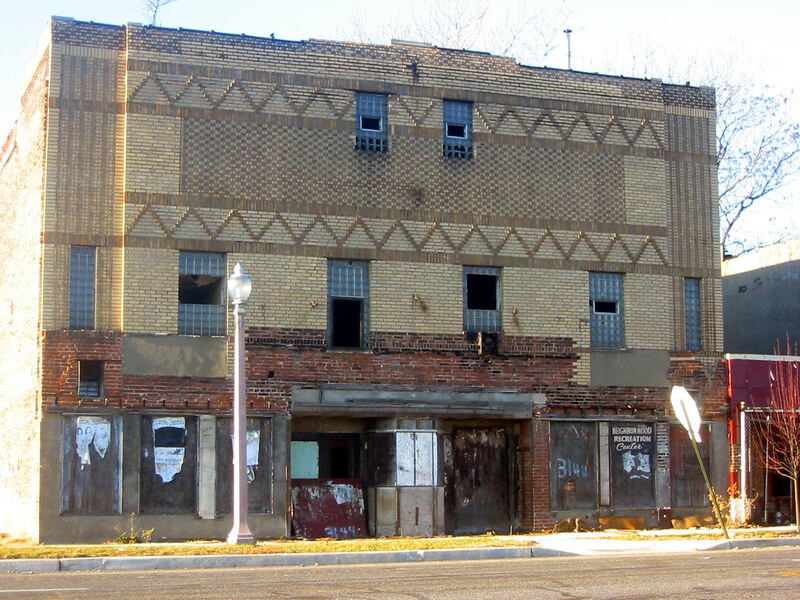 The Regal Theater like the soon to be demolished Shady Oak was a single screen neighborhood theater located at 3144 Martin Luther King just east of Compton. It was built for the Arthur chain in either 1931 (per Cinema Treasures) or 1937 (per Ecology of Absence). Its facade was fairly simple with art deco patterns of textured above where the marquee would have been located and windows of glass block (probably original) The first floor was clad in a blue marble like material, likely Vitrolite. A photo by Eric Post in his book Ghost Town shows some of this remaining at the center ticket booth as well as some lovely art deco decoration. The building had been owned by LRA since 1986 and I presumed it was demolished (in 2006) for expansion of parking for a newer church just to the south. The church owned the smaller commercial buildings just west of the theater and those buildings were demolished shortly after the theater. City records show a 2007 aerial however shows both demolition sites as empty vacant lots and LRA still owning the theater site. 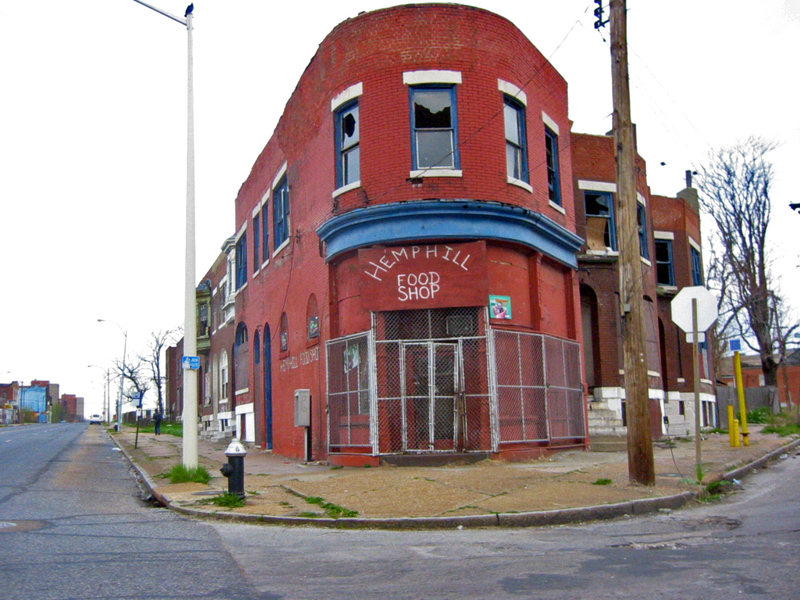 There was a sign on the building until its demolition that read "Neighborhood Recreation Center", which the area could probably use. 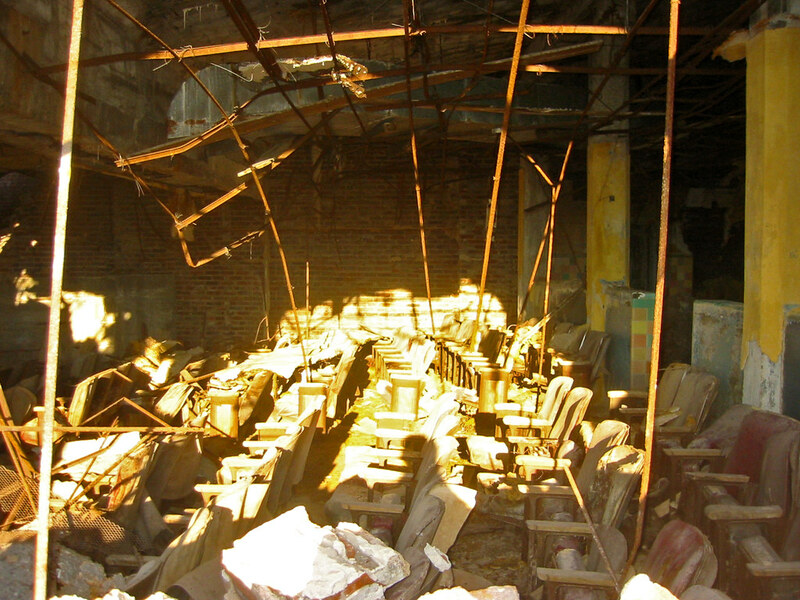 I am not sure if it was ever used for this purpose since there were still seats in the auditorium at the time of demolition. The building could have also made good expansion space for the church. A block east across the street at the corner of MLK and Glasgow sat a small group of buildings which ingeniously held the 50 +/- degree angled corner. 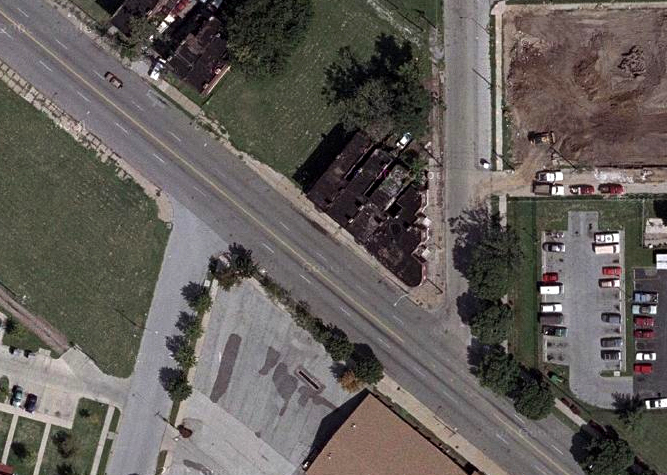 Along MLK stood 3 regularly shaped townhomes set back about 4 feet from the sidewalk. 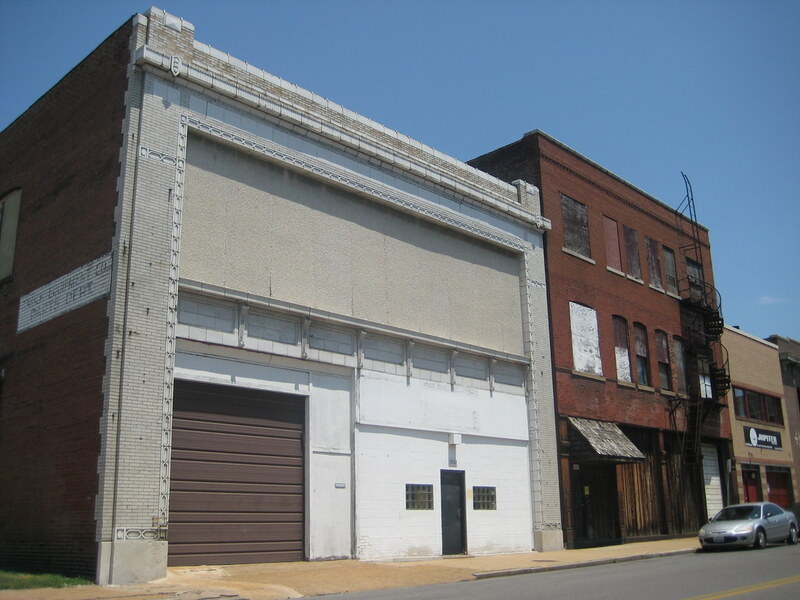 Attached to the east, the corner building boasted a graceful curved cast iron storefront with a small townhome unit on MLK and an additional apartment above the commercial space. North of this facing Glasgow were two small sawtoothed townhome units, with the second one having a depth of no more than 20 feet. 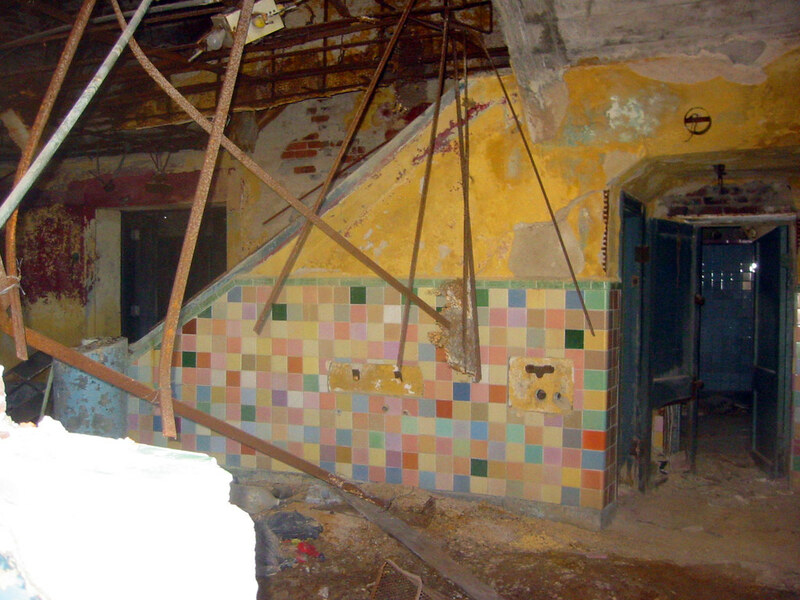 Like the theater, these buildings at MLK & Glasgow were owned by the local concentration camp for buildings, the LRA, and while abandoned and in need of rehabilitation, they were structurally in very sound condition. 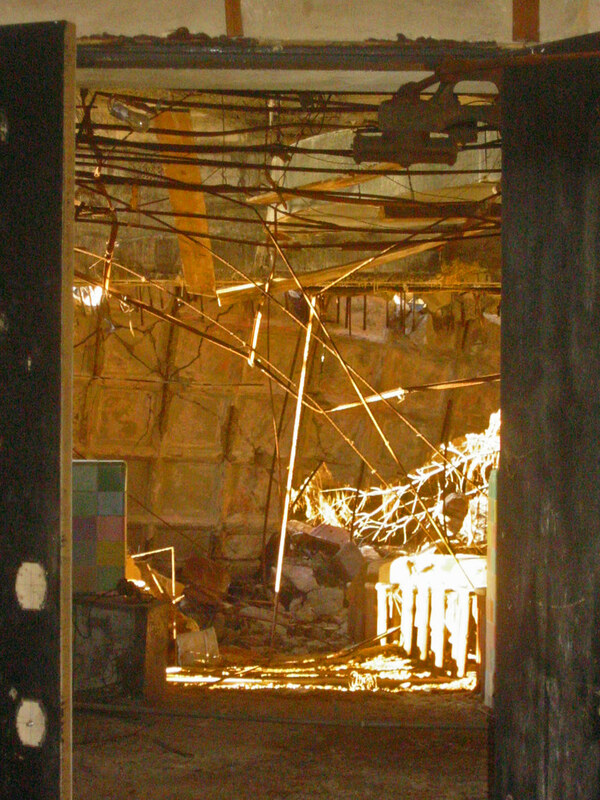 They were demolished seemingly for no reason with an "emergency" permit in July 2004. As with the recently lost corners of Glasgow & St. Louis Avenues, this group of buildings anchored the block with a wonderful way of handling a difficult site, and one which sadly is likely to not ever be repeated. Without the adoption of form based zoning or an "urban code", the ultimate replacement for once great corners like this will be suburban style mediocrity.